Every day in LAUSD schools, administrators have to subject students to mandatory random metal detector searches. This search policy is justified by claiming they keep students safe. Proponents of the searches dismiss the idea that not only is the policy motivated by a racially biased lens of “safety,” but also that the searches are racially biased in implementation. However, when we look to student experiences we develop a more accurate picture of the damage these searches cause. Students report having things taken from them like sharpies, white out, and hand sanitizer. In the 2013-2014 and 2014-2015 school years, random searches turned up zero guns and instead 1566 school supplies were confiscated. Further, students report the searches are anything but “random”—they are targeted by race and by class status in which students in advanced classes are rarely searched. In this post, Lizbeth, a current high school student in LAUSD shares her experiences. We challenge readers to ask, if the searches are not random and they are not actually for safety, what are they for? Why do we continue to subject our students to them? Our hope is that we will seek out and heed more student voices to shape their own experiences and inform of us of their needs to build trusting, supportive, and humanizing environments to learn. My name is Lizbeth Hernandez. I would like to share with you all a story of my experience being searched at Alexander Hamilton High School. It all started when I was in English class working and just listening to the teacher. Everything was okay until three minutes later when the security guard came inside the classroom with two officers behind him. The officers said they were doing a random search, but once they started naming kids, I thought to myself that this wasn’t a random search at all. I thought this because my teacher gave them the roster and then they chose who they wanted to call out. I got called up and they asked me to bring all my belongings up to the front. I felt normal because I had nothing to hide. The two officers started to dump everything out of my bag, even my personal hygiene items. I was feeling embarrassed about the way they did the search in front of my classmates. After that, they asked if I had a locker I said yes, then they told me to go outside and go open my locker for them to check it. They started to dump everything out. They ended up taking away my sharpies, my highlighters, and other school supplies. I was mad when they took my belongings. They treated me and my classmates like criminals. After going through that experience, I believe that metal detectors should be taken out of all schools because many students wouldn’t want to go to a school where they don’t feel safe. Students feel unsafe because they feel like they are getting targeted and other students might think that those who are searched are criminals. I didn’t get a good education because of all the random searches. For example, we would waste time and not learn anything new. Also, we wouldn’t have a chance to turn in our assignments which negatively affected our grades. This is why I decided to find another school; a school that is actually gives me an education and makes me feel safe. I found a school named Central High School Mar Vista Gardens. Since the day I started attending this school, I never regretted it because it is the safest school I’ve been to. We get to choose what we want learn and do, we get to circle up and discuss our likes and dislikes, and sometimes we even play games to build communication and community. At my old school there was a heavy security presence who would just watch students get into fights and wouldn’t do anything until the administration came out. At Central, there aren’t any security guards or police officers walking around. At Hamilton, teachers and counselors wouldn’t listen to students when they had problems that turned into fights. On the other hand, Vitaly, my teacher at Central, will pull us out to check in to see if everything is going great or if we need anything. 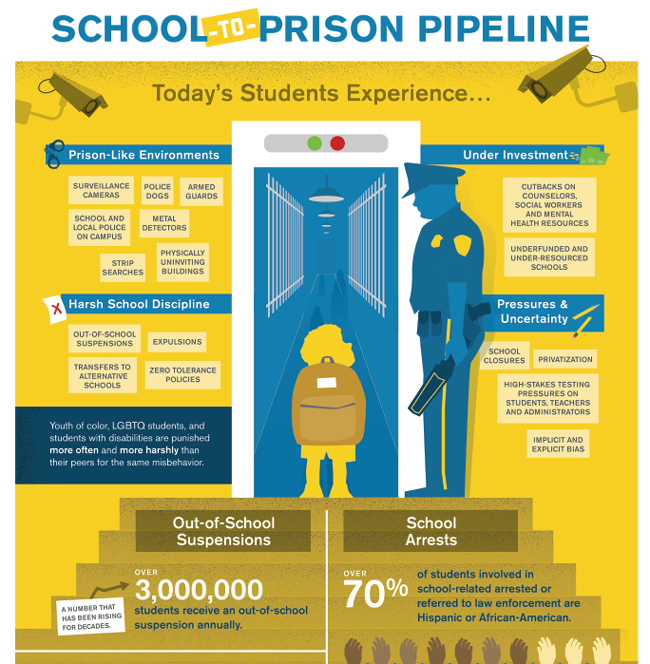 Honestly, I think all schools should be a safe community rather than being a prison-school where students are getting searched all the time like criminal suspects. #StudentsNotSuspects Campaign to end random searches in LAUSD is supported by a coalition of organizations including Students Deserve, Youth Justice Coalition, Public Counsel, ACLU, Black Lives Matter LA, and UTLA.